Did you know you could eat fiddlehead ferns? You know, those cool spirally young sprouts that grow up from the base of a fern and slowly enlarge and roll out to to become fern fronds? When they are in this young fiddlehead stage they are crisp, tasty and good for you. These ferns have been a rare delicacy in the past, mostly because not many people realize you can eat them. But they are abundant and are gaining in popularity and recognition as the general eating public becomes more sophisticated. I've started to see them available in some grocery stores such as Whole Foods. They are only available fresh for a couple months of Spring each year but you may be able to find them frozen as well throughout the year. I've found that these are best suited to simple preparation, letting their natural freshness shine through. I think a bit of smokey bacon and garlic are a great combination. They taste a bit reminicent of asparagus but have their own unique flavor. They are best when they still have a bit of crunch to them, not cooked too long. Of note, if you are vegetarian or vegan, you can use the same basic recipe but just use some olive oil instead of the bacon for cooking. I haven't cooked fiddlehead ferns directly on the grill as they are rather small and thin and could easily fall through the grill grate. 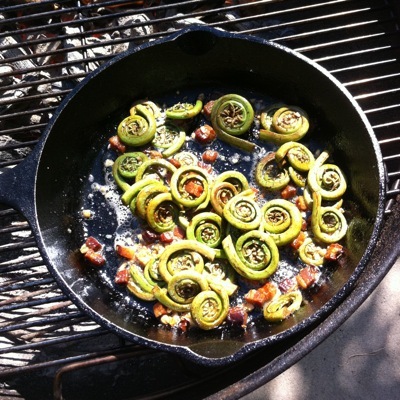 You could certainly cook them in a vegetable grilling basket or skillet but for this ferns recipe I use a heavy cast iron skillet. First, rinse the fiddleheads thoroughly in a strainer under cool running water. Then soak them in a bowl of cool water for a few minutes. Use your fingers to rub the surface of the ferns to dislodge any dirt or chaff on the surface. Drain and dry them. If the the ends are grungy or black, you can trim the free cut ends just a bit. Once your grill is going, lay your cast iron skillet on the grill over direct heat and give it a minute to start warming up. Then add the bacon lardons or cut up bacon into the pan. Cook, stirring frequently until the bacon throws off some fat and starts to brown around the edges or to your liking. Toss in the fiddleheads and the minced garlic and cook, stirring frequently, for a few minutes. Season to taste with good sea salt and freshly ground black pepper. The fiddleheads are done when they just begin to soften but still have a bit of a crunchy snap to them when bit into. If you want them even more flavorful and a bit creamy, throw in a couple pats of butter at the very end and stir just until the butter melts and coats the ferns. Thats it! Your fiddlehead ferns are ready to be served! 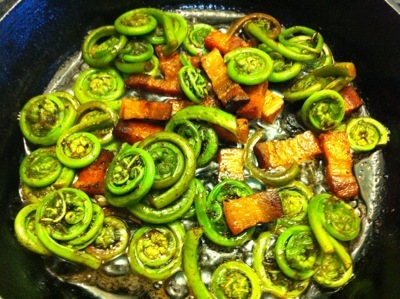 Done with this Fiddlehead Ferns recipe? 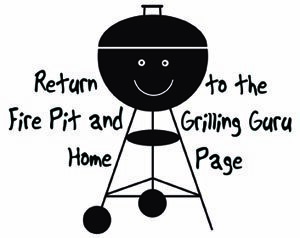 Return to the Barbeque and Grill Recipe page.